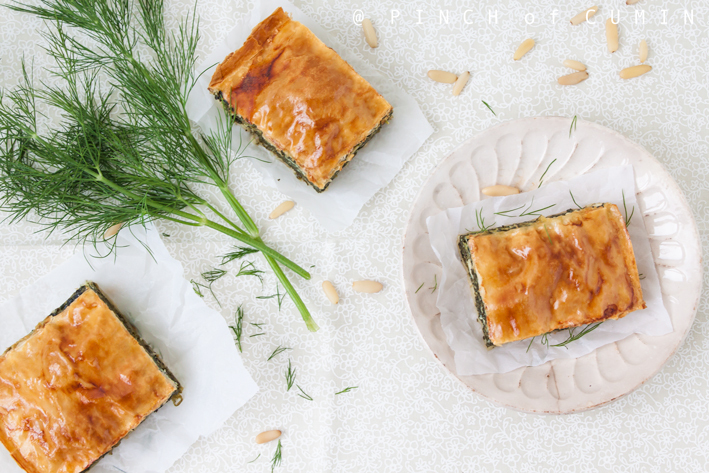 I publish this recipe in honor of two good friends, thanks to whom I travelled to Greece for my first time due to their wedding. Sofía is Greek and Carlos is Spanish, and they decided to get married in Volos, a nice seaside town 300km far from Athens. The wedding was an experience at every level, from the incredible landscapes to local traditions, not to mention wonderful people and a very rich and tasty gastronomy. I did not try Spanakotiropita in that trip, in fact I did not know about it until Carlos sent me the recipe, so it is by the moment my second approach to Greek gastronomy –I have also in mind mousakka –and I hope it does not take me that long to cook it-. The result is simply spectacular. And it seems it is very common in street food stands as a snack or appetizer. My 12 points go to Greece! Fry lightly scallions in a skillet with a bit of oil until they are soft. Add fresh spinachs and also fry them until they reduce their volume. Season with pepper and dill. Take them out from heat and remove the excess of liquid with the help of a strainer, pressing it well. 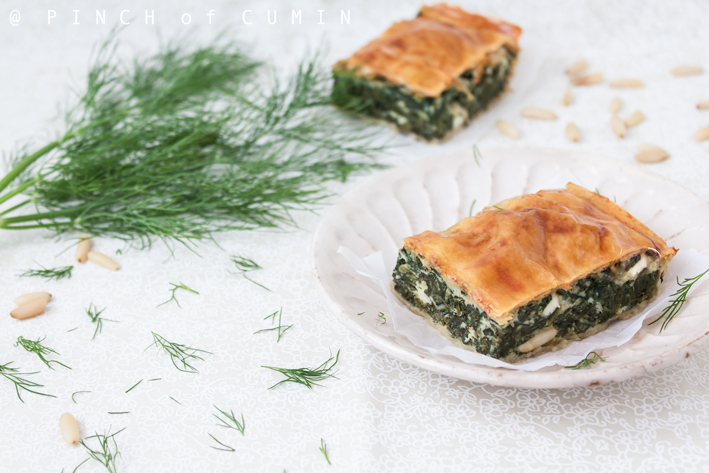 Chop feta cheese into small cubes and add it together with pine nuts to spinach and scallions. When it is mixed, season with salt (feta cheese is quite salty, so that’s why you do not add salt until the end and actually there is not a big need of it). Whisk the egg and add it to spinachs. Grease a baking tin with butter and spread one phyllo sheet. Brush with a bit of oil with the help of a kitchen brush. Put another sheet on top and repeat the process of brushing with oil. Repeat this until you have 5 or 6 layers. Put the mixture in the center and spread it equally to the borders. 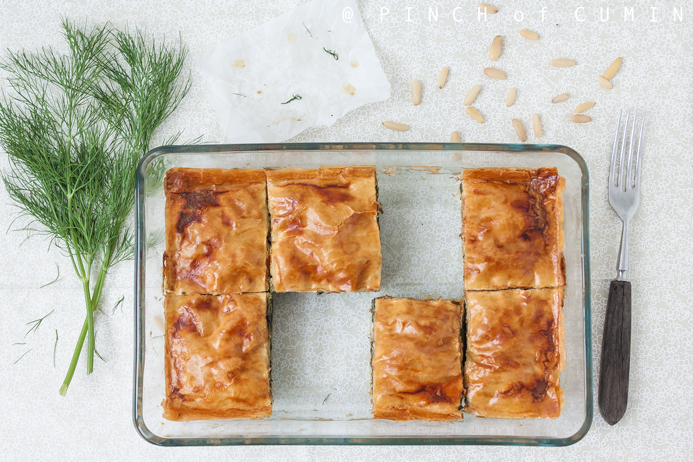 Repeat the process of phyllo sheets, placing another 5 or 6 sheets on top of the mixture. If you want you can pre-cut it before baking it so that you can cut it better afterwards. Brush the last phyllo sheet with whisked egg so that it is shiny at the end. Preheat oven for 5 minutes to 200ºC and bake it for about 40 minutes until it is brown. The final thickness is just illustrative. In this case, it is really thin, but it could be thicker. It is all about increasing the thickness of spinach layer.